Did the Tigers Ignore Milt & Frank Bolling? Milt Bolling exists! With a working address confirmed in a July 26 blog post featuring Baseball Address List compiler and hobby hero Harvey Meiselman, I received a fast, small reply from the former infielder this week. Small in two ways. First, Bolling offered Dragnet-like Sgt. Joe Friday (“Just the facts, ma’am!”) replies to my questions. Secondly, I was struck by Bolling’s TINY handwriting. His autograph would double as an eye exam. Bolling’s second baseball career came as a Boston Red Sox scout from 1965-94. Did he have even one or two discoveries that he remembers most, that he’s proudest of? Most importantly, I wanted to know about his relationship with his younger brother Frank, a major league mainstay from 1954-66. Had they dared imagine having joint careers in pro ball someday? 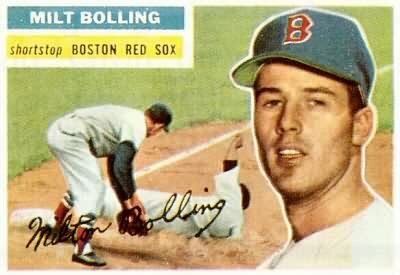 The sad part of Milt Bolling’s reply revolved around 1958. With Milt at short and Frank at second, they gave the Detroit Tigers only the third brotherly double play combination in baseball history — the first-ever in the American League! What recognition did the team provide? Since the 1980s, team media relations departments have churned out pre-game notes. Imagine getting more than 20 pages of statistics, anniversaries and anecdotes to use, any way you want. After the game, the same PR staff passes out a game wrapup packet. Often, you’ll get just as many pages. Reporters could sleep (or eat and drink) through the game, never paying attention. The team does almost everything, minus putting your byline atop your story. Additionally, teams make every game a made-for-television event. Near-perfect game pitcher Armando Galarraga gets to present the lineup card to controversial umpire Jim Joyce the next day. Galarraga receives a new car for his sportsmanship. Every second seems like a photo opp. Baseball didn’t always celebrate every moment. Reporters were all about scores and stats. History escaped their attention. The Bolling brothers gave Detroit a moment in the spotlight. There’s still time for the team to thank them. Jake Striker’s Cleveland Dream Came True!